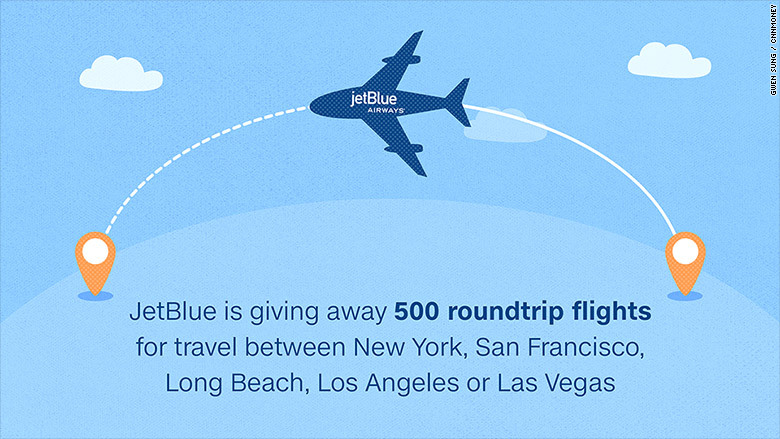 If you've never flown on JetBlue before, now's your chance to score a free flight. The airline is giving away 500 roundtrip flights to travelers in New York and California who have never flown on its planes. The contest, dubbed "Calling all JetBlue Virgins" comes on the heels of the company's failed bid to acquire Virgin America (VA) last week. "After the acquisition announcement, we recognized that travelers flying certain routes may soon face shrinking choices," JetBlue (JBLU) said in a statement to CNNMoney. And JetBlue is betting that two states on opposite coasts have the most potential to pick up new customers. "We think there are probably a few people in California and New York questioning their preferred airlines." Consumers can enter the sweepstakes online by filling out a form that requires their name, date of birth, email, state and phone number. The promotion ends Wednesday at 11:59pm ET and contestants must be at least 18 years old. The winners will be able to fly between New York, San Francisco, Long Beach, Los Angeles or Las Vegas. JetBlue reportedly ended up in a bidding war with Alaska Airlines (ALK) over West-Coast based Virgin America. Alaska Airlines emerged victorious with a $2.6 billion purchase price. On Tuesday, JetBlue announced plans to expand its "Mint premium experience," which includes lie-flat seats, to more cross-country flights.